Listening to the two latest from Djam Karet back-to-back seems like listening to a 2-CD set. In fact, New Dark Age and Ascension are from the same sessions. The former is the band's new release on Cuneiform, and Ascension is a limited edition of 750 released by Djam Karet and consists of tracks that the band considers to be further explorations of the themes and concepts heard on New Dark Age. Occupying a realm that crosses comfortably between progressive rock, ambient, and psychedelia, Djam Karet play beautiful and totally mind-bending instrumental music that will appeal to space rock and prog fans alike. The band consists of Gayle Ellett on guitars, mellotron, organ, synths, and effects, Chuck Oken Jr on drums, percussion, and synths, Henry J. Osborne on bass and percussion, and Mike Henderson on guitars, percussion, synths, and effects. Those who have heard several of Djam Karet's albums will agree that there is much in the band's music that is recognizable and distinct. Equally adept at both ambient music and balls-to-the-wall rock, New Dark Age finds a precision combination between both realms. The opening track, "No Man's Land", sets the tone for the set, being a progressive rocker with guitars that are both melodic and blistering. There's a heavy guitar playing at a moderate pace but with a grinding acidic edge, a rocking guitar kicking out screaming shred solos, and somewhat more in the backdrop is a jazz-fusion tinged sound that along with the rhythm section keeps a steady flow moving. Other highlights include "Web Of Medea", a dark atmospheric piece with a deep thudding Zheul-ish bass, orchestral, spacey, and sometimes Pink Floyd-like keyboards, and singing guitars. The beauty of the music is in the near perfect harmonizing of the contrasting guitar sounds. And there's some seriously spacey UFO synths that add a nice freaky element to the music. "All Clear" is a head bopping prog-fusion rocker with a nice groove. It includes some killer rocking guitar work, once again with that screaming edge that will have you on your feet air-guitaring in a state of rocking bliss. But the music just as quickly shifts to a slower paced proggy tempo with some tasty keyboards and a guitar sound that reminds me of Dave Gilmour from Obscured By Clouds. "Going Home" is a similar track with fiery cosmic guitars and trippy synths. "Raising Orpheus" is part ambient and part melodic rock, the keyboards having a strong Rick Wright sound circa Wish You Were Here. The guitars, as usual for Djam Karet, occupy several parallel dimensions, all in sync with one another, proving that order in the universe prevails over chaos. "Alone With The River Man" is a highlight track with varied ethnic percussion taking front and center stage, along with simple but pleasing acoustic guitar patterns and Frippoid guitar licks, the resulting whole setting a melodic spacey progressive rock groove. 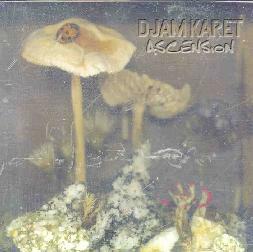 The main difference between Ascension and New Dark Age is that Ascension features more acoustic guitars and ethnic percussion, and the ambient side of Djam Karet is more in evidence. It's more serene in a kosmiche way. I hear Pink Floyd, some ethnic influences, and at times something that makes me think of a more progressive rock and psychedelic version of Shadowfax. But it is, in essence, very much in the spirit of New Dark Age. "Arose From The Ashes", "Swimming In The Big Sky", and "Special Cases" all feature an acoustic guitar and percussion combination that is soothing and psychedelic in an ethnic/tribal way. I particularly liked the droning didgeridoo, ambient keyboards, and soundscape guitars on "Arose From The Ashes". "Swimming In The Big Sky" includes a similar acoustic guitar and percussion combination that sets the pace while ambient space guitars and subtle singing keyboards take the lead. "Special Cases" is similar still, with wailing soundscape guitar licks, drone bass, and a dancey beat. "The Hanging Tree" is a calm but steady Pink Floyd-ish tune, with cosmically melodic keys that will sweep you away, and a tasty guitar solo with a dirty Bluesy edge. "Stage Three" is a powerful tune that feels like an army marching toward victory. One of the most beautiful guitar tracks on the album, it shows that these guys can do more with a few notes than most bands can do with hundreds. Ellett and Henderson's fingers dance lightly and with precision on their respective fretboards, a knowing communication between them making each note harmonize to produce a seductive trance effect. 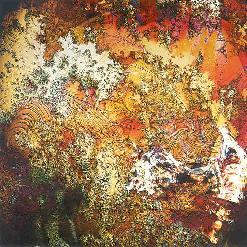 And "Disintegration" is a psychedelic voyage with lots of cosmic space sounds and thematic twists and turns. It includes ambient music, Middle Eastern/Indian percussion and flutes, plenty of soaring spacey electronic passages, and continually evolving sounds and textures. A perfectly enjoyable journey that I'd say is my favorite track from either album. In summary, veteran Djam Karet fans are sure to be pleased with the sounds heard on New Dark Age and it's companion release, Ascension. If you enjoy creative guitar work that exists in both the rock and ambient realms then you're in for a real treat. And readers who have yet to check out this band are heartily encouraged to do so. With two new releases and having performed at two festivals (Nearfest and ProgWest), 2001 has been a busy year for Djam Karet. So wanting to learn more about this exciting band I got on the phone with Gayle Ellett for a chat one Monday afternoon in December. AI: It seems like 2001 was a big year for Djam Karet. You had two new albums and two festival appearances (NearFEST and ProgWest). Has all this been a boost for the band in terms of exposure? Gayle Ellett (GE): It has been really helpful for us exposure-wise. And NearFEST was particularly helpful to us. We moved a lot of CDS, we got a lot more traffic to our web site, and it was totally advantageous and worked out great. AI: I read on your web site about not doing any shows in 2002. Were you so busy that you want to focus on recording? GE: Exactly. We're going to record probably two new records during the next year. We'll probably start in January. It's typical for us to go a year or two and not do any shows anyway. We only play a few shows every couple of years. For a long time what we've been doing is just having the CDs be our way of getting out there and getting exposure. And Los Angeles is a really pathetic music town even though you'd think it wouldn't be, but it's ridiculous to try and play around here. A lot of the clubs make you buy tickets to your own shows. AI: After talking to a lot of musicians in both L.A. and New York everybody seems to say the same thing on both coasts. GE: I think that's true. But when I visit my brother in Chicago or you go to any kind of "normal" town, there's all sorts of neighborhood bars that have neighborhood bands, and the bands get $100 or something, and it's free to go in or costs $1... and we don't have that much in L.A. which is weird. AI: I know they're from the same sessions, but the main difference, to my ears, between New Dark Age and Ascension seems to be that Ascension has more acoustic guitars, and ethnic percussion, and it's generally got a more pastoral feel. Does the band view the chosen tracks as flowing in any way like that or any other way that was deliberately contrasted from New Dark Age? GE: Well mostly we had all of the music that we knew for sure we wanted to have on New Dark Age before we finished all of the music that was going to be on Ascension. But we really tried to put just all the best tunes, the ones that we liked, on New Dark Age, and then leftover stuff was what Ascension is except then we worked on it more and wrote more tunes and it became not like a leftover record but an even cooler record really than New Dark Age. And Mike's a really good acoustic guitar player. It's intentional but the main focus was New Dark Age, and then once that record was done and assembled we kept working on Ascension until it came out surprisingly well. AI: Speaking more generally, the thing that strikes me about Djam Karet's music as a whole is the variety of sounds and influences. There's so much to appeal to progressive rock fans and certainly my space rock audience as well. You can rock out but also do these spacey ambient journeys. In fact, I think some years back Suspension and Displacement And Burning The Hard City were released simultaneously. Was that to deliberately highlight these different sides to the band? GE: Yeah. No doubt they were deliberately separated. And on some of our newer records they're more combined. We're going to do two new records most likely starting next month (January). But they'll probably be quite different and one of them's probably going to be ambient electronic, without a bunch of pounding drums and guitar solos. A lot of us were born around 1960, so a lot of us listened to a lot of music in the 70s when Brian Eno was doing tons of cool electronic music and... all of us play keyboards besides the instruments that we play. Chuck recently bought a bunch of new great keyboards. It's super fun to do the rocking rippin music where the drums are pounding and the bass is going all over the place and we can play fiery solos. But it is nice to make the dreamy, spacey... it's a good balance. AI: I think you do a great job of balancing it all. Another thing that stands out is the combination of yours and Mike's guitars. You'll each be playing what seems like completely different sounds, but they harmonize in a beautiful way. GE: It's a good deal because Mike's a super great guitar player and he has totally different guitars and amplifier systems than I have. And if I was ever going to buy a new guitar or new amplifier I would not get one that he already has. It's nice that we have a different playing style, a different sonic style, but our group just gives us a lot of room to do what we want. Most groups say to themselves, We're a heavy metal band, or We're a progressive band, so they play all the music within that one style. And in our group we play a broad range of musical styles. AI: And in your case it works really well. Listening to all the different sounding albums it's all really very coherent. GE: Well we have a lot of fun making them. The electronic stuff is super fun to record, while the rock �n rolly stuff is more demanding to record. But it's very fun to create those electronic soundscapes in the studio. And lots of our songs initially would have way more tracks added into them, but we end up cutting out a lot of tracks... a lot of individual instruments and making it more minimal. There's a lot of recording that goes into it that never makes it to the final mix. AI: So I guess that explains the temptation to do these limited releases, just to get some of this stuff that you think is still strong out there. GE: Yeah. We don't really play popular music so we're not really a very popular group, so we don't end up selling huge amounts of CDs anyway. When I play our music to people in general, I expect in general they're not going to like it. AI: So has it been the progressive rock community that's embraced you for the most part? Do you feel like you get outside that? GE: Well we get a little bit of exposure in the electronic world. But the progressive rock world has embraced us totally, which is really good. AI: You said you all grew up in the 1970s. Did you get into all the classic Krautrock and German electronic musicians? GE: Yeah. And all of us had similar musical tastes. So we were really into Tangerine Dream, and Kraftwerk, and I've seen Kraftwerk play before, the Allman Brothers were really crankin' and writing really good ensemble music, and I saw Yes play a gazillion times, so there's a lot of groups out there that really played as "groups". Where the individual people are allowed to be up-front. In the average band the drummer and bass player are always stuck way back there. Not in the mix, but back there in how busy and up-front they play. It's hard to tell the personality of one drummer to another in regular popular music because they're so relegated to the most minimal patterns possible. So it's a great venue in our group to have Henry and Chuck, who are such good players, be free to play a lot more aggressively. And it makes it all the more fun for us to play it. That's a huge benefit. If we had a lead singer we'd wisely be supportive and play back, to support that. But since we don't, everyone can pretty much wail at it all the time. AI: You've never had any vocals right? GE: No. But I wouldn't be completely adverse to it in the future. Because we're not stuck trying to recreate all of our previous records. So we're free to do whatever we want to musically, and it gets stagnant to keep completely making the same record over and over. Like I'm a huge fan of Ozric Tentacles, and it's cool that whatever record you put on sounds like their stuff. But all the records sound so similar. But I really like them and they're really good, and I don't now buy every new record that they come out with, but I have at least 12 of them and they're great. We look up to those guys. A lot of their stuff just really rips. AI: You guys have been around since the mid-80s and you mentioned the Ozrics so I'm prompted to ask... were you part of the whole DIY cassette networking thing, Option magazine and all that? GE: Yeah, we were in Option all the time. I think Reflections From The Firepool was the first one we put out on CD. But too many groups make a demo hoping some label is going to pick them up. And no label is going to pick them up so they just have a 3-song demo. So it just makes more sense to make a real record and put it out on CD. And now the cost for doing all that stuff is still getting cheaper and cheaper. So that's what really helped us was to just make a product and then give a bunch a way. Y'know, sell them, but each time we'd have a new album out there'd be a certain amount delegated as promos to go to radio stations and magazines. And they did tremendously well. We got fantastic coverage and exposure, the records that we're making in our house, or in the basement of a warehouse. AI: With the exception of the Cuneiform releases have you released everything yourselves or have there been other labels as well? GE: We've just used our own label and Cuneiform. With Cuneiform we still record and produce it. We just give them the master tapes, and they do the artwork and packaging and stuff. So it helps to own our own studio that we can work in. We just bought a new computerized 24-track system... Chuck did... that we're going to do our two new records on. The ones you heard, Ascension and New Dark Age, were done on 16-track. So we're psyched about getting this new machine. AI: Going back to the ambient stuff, what was the impetus for the Collaborator CD (reviewed in AI #10), hooking up with all these ambient musicians, and I was wondering if you had any thoughts about doing that in a more rock context? GE: It was super fun to do that Collaborator project. We asked people to send us something on DAT, and we'd never know what would come in the mail but we'd get cool stuff to listen to and to play to, and some people would give us one 15 minute long track and other people would give us 10 really short tracks. I just told people, don't give us harmony, melody, and rhythm all on one piece because then you're not going to leave much space. So people sent in just rhythms, or just chords... it was a fun project and it would be great to do a rock version. We could do basic drum tracks and send them to other groups to have them do other guitar and keyboard parts over them. AI: I was listening to your NearFEST performance last night which is available online, and what really struck me is what a really solid ROCK band Djam Karet is. And I was curious given that each member contributes synths do you typically downplay synths in concert or do you do other types of concerts where you focus on the more ambient stuff? The NearFEST performance sounded like mostly a rock show. GE: It was. Because since we were traveling we needed to have a minimal amount of stuff. We brought two keyboards and I broke one of them on the way out there. But that was deliberately focused on a heavy guitar sound and not a keyboardy sound. And then when we played at the ProgWest show we did a much more electronic show. AI: So under ideal circumstances you do more of a mixture? GE: Yeah. We play a lot more tape loopy, atmospheric stuff. And that's harder to do live anyway even if we have more keyboards. If, on the record, there's 16 tracks of stuff, we might take that song and take out 10 of those tracks and mix it down to CD, and when we're playing live we'll play it through the P.A. and we'll add live keyboards and guitar over it. AI: So that works pretty good? GE: Yeah, cause then we're kind of cheating... but it's a good kind of cheating. We can do more than we can really do on our own. Cause that electronic stuff is heavily overdubbed. So it's not conducive to being played live although it's a really fun thing to do. It's a fun way to express yourself in that spacey dark kind of electronic stuff. AI: Do you do improvisations in your live performances? GE: Absolutely. And even on New Dark Age, tons of those tunes... the second half of them... are totally improvised. Usually we record the drums first, and then bass and rhythm instruments, and then do solos over it. A lot of it sounds like we're all playing at the same time but really a lot of it's just overdubbed. But a lot of those songs on New Dark Age... the rock �n roll type songs... we knew how the beginning part of the song was, but Chuck would just improvise another 3 or 5 minutes of drumming at the end and we would be playing along with him on a scratch track, that we'd later erase. Then the song has this long drum section that we'd create another part to it without having ever having rehearsed it before or know how it's going. So whenever we play live we have to learn how to play it as a band cause we never really did play it as a band. AI: [laughs] So you have to sit back and listen to your CDs so you can learn your songs! GE: Exactly. It's not real apparent that the second half of a lot of the tunes on New Dark Age are written that way. That's why they have a jammy feel to them a lot of times. And jammings good, and we don't fear the groove. It's good to have music with a strong groove... that rocks. I'm amazed that more people don't do what we do. Ozric Tentacles kind of do. They have a strong groove with rippin solos and lots of weird keyboards. AI: Yeah, there's tracks on New Dark Age where you've got those rippin solos, but they're all within a larger context. GE: I'm really lucky to play with the people I play with because they're all really good and we've all known each other for a long time, and we all have a similar goal of what we're trying to do. AI: You've been together since �85? �86? AI: That's impressive longevity in the indie world. GE: And we have 13 releases out now. Two are out of print. GE: No Commericial Potential, our first release. And Kafkas Breakfast, which was a British import. AI: Cuneiform has reissued some of your music. Any thought to them reissuing those? GE: Well I want to remix both of them. And then maybe we'll release them. I'm not sure if Cuneiform's into it... they might be. They only release a certain number of records each year so that they can give each one the proper attention... which is smart. It's low on the priority list though because we want to do two records of new music now. Releasing old stuff is a backburner idea now. AI: When the band started in the mid-80s did you think of yourselves as a progressive rock band, or did you not even think in terms of labels? GE: We didn't really think in terms of labels too much. But for the first couple years all of our shows were like the album Still No Commericial Potential (reviewed in AI #10). But for years, all of our shows and all of our rehearsals always were totally improvised. So that was more like a jazz-fusion thing. But that's what taught us how to play as a group, and knowing when not to play ended up being a lot more important than being able to play your instrument well. AI: And that goes back to my comment about how yours and Mike's guitars sync up together so beautifully, I'm sure it's from jamming together for so long. GE: It is. And Henry's bass playing and Chuck's drumming, they both play very busy but they still make a strong groove. Which is very much in a jazz style. It's just a great format for all of us to try to excel as players, and it's very challenging for us to play to, which is really fun. AI: Your web page talks about film visuals in your performance at ProgWest. Can you tell me about these visuals because your music certainly is very image inducing. GE: I never even saw what we were going to use until we were playing. Chuck is always doing something like that. It was from a DVD of Bill Ellsworth's computer graphics work. Bill Ellsworth is the guy who did some of our album covers and he works for Cuneiform, but he has his own graphic arts studio. So he was showing some DVDs on the big screen behind us which... I'd never seen them before but they looked really cool and it worked out really well. GE: It was moving computer graphics like landscapes and spaceships flying around. He has a DVD out which I think is called Destiny's Child, which is a super well done, really colorful, semi-abstract computer thing... I don't know how to describe it. AI: I also saw on your web site something about a Djam Karet International Fan Day in Europe. Have you ever played overseas? Do you feel like you have a more sizable audience in Europe relative to the US? GE: We're interested in playing over there. And they sent us pictures of their fan day which is really cool of them. And we sent them special CDRs of unreleased music. And they sent us some cool t-shirts that they had printed up. They've been really helpful and supportive. We'd really like to play over there but it's really expensive to travel. I've been trying to use the internet to contact other festivals, but it's tough. We don't need to do it and make money, but we don't want to do it and lose money. But in Europe they're interested in a much broader range of music, whereas here Pop is huge and everything other than Pop is completely unpopular. Like jazz music is incredibly unpopular in America. It's way huger in Europe, so I think in Europe because the countries are small and they're used to running into people of different cultures, and they aren't so culturally myopic like we are... they love their pop music but they also really love jazz and all sorts of different styles of music, and progressive music is way bigger over there. AI: I know you and Mike each have solo project samples available on Mp3.com. I was hoping you could tell me about some of the bands' solo works. GE: I have two under the name The Maskit Chamber and Mike has two under the name HybridVigor. But Mike right now is working on a new album which should be out in about two months. I'm optimistic that it's going to be a really cool record. Mike was very influential on Ascension and New Dark Age. We recorded those two albums in a recording studio that Mike owns. In the past sometimes Chuck has mostly overseen the recording of a record, or I oversaw the recording of a record, and what Mike brought to the two new CDs that we have out now is really great. I'm so happy with the way they were recorded and how well they were mixed. So I'm sure Mike's new solo record is going to be really cool, whatever it's going to be. AI: Are the two you did fairly recent? GE: Yeah, they're just from last Christmas. One is The Fourth Wave. That's a single 50 minute long ambient track that has parts where I play acoustic guitar, mellotron, and moog, but other parts where it's just atmospheric loopy stuff, and a lot of recordings that I made in Morocco. I play about 30 instruments on it. Then the other one, Heaven Machine, that's ten individual progressive rock tracks. Contact via snail mail c/o Djam Karet; PO Box 1421; Topanga, CA 90290. New Dark Age is distributed by Cuneiform Records. You can visit their web site at: http://www.cuneiformrecords.com. To hear samples of Djam Karet's music you can visit their Mp3.com web site at: http://www.mp3.com/djamkaret/. Check out Djam Karet's performance at the NearFEST 2001 festival in streaming RealAudio at: http://www.studiomlive.com/nearfest2001/djamkaret.html.